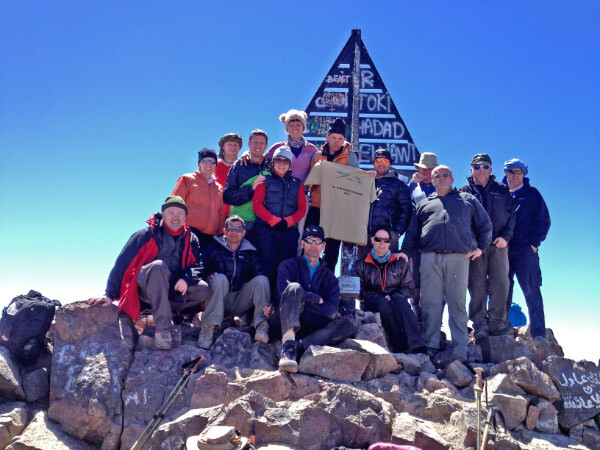 Fourteen members of 201 (Northern) Field Hospital (Volunteers) took part in an expedition in the High Atlas Mountain Range (Morocco) with the ultimate aim of reaching the summit of Mount Toubkal at 4167m. We were accompanied by a local guide and members of the Moroccan Army. During the 10 day trek there were opportunities to improve navigation skills, develop relationships within the team, as well as introducing members of the group to walking at high altitude and mountain awareness (including the Summer Mountain Foundation Award). We followed a circular route taking in local villages and customs, the route also allowed for gradual increase in height to reduce the risk of Acute Mountain Sickness. Each leg was between 10-21 km – we ‘walked high and slept low’ gaining height from 1740m to Jebel Toubkal Summit at 4167m. The food was prepared for us and was local style, traditional Moroccan dishes, and we also drank gallons of local mint tea – locally known as Berber Whiskey! All food for the trek was carried on the back of Mules and consisted of salad, soup, couscous and pasta accompanied with fish, and vegetable tagines. Despite the basic nature of the food, a surprising variety was provided and all meals were delicious and filling. The risks in trekking in remote areas were highlighted early on when a path disintegrated beneath our expedition leader, resulting in a fall of several metres and collision with a large boulder moving at speed. Fortunately this resulted in cuts and bruises and no broken bones allowing us to continue the expedition with a gentle reminder of the potential dangers. The accommodation was in local gites, the standard of which varied, but all exceeded our expectations. They consisted of shared rooms with mattresses on the floor, basic washing facilities and the luxury of an occasional warm shower. The gites were usually in small mountain villages, where the local population welcomed us and in one village they entertained us with a local wedding ceremony, where 2 of our unsuspecting expedition members were married off in Berber Style! Morale remained high with much laughter, usually at the light-hearted expense of other members of the team, although the trekking was arduous and tiring. Entertainment provided by the muleteers and chefs also added to the experience. Along with time spent in Marrakech, the expedition allowed us to understand the culture and experience the local customs and beauty of the country. Despite differences in levels of hygiene compared to those which we are used to, we were very fortunate that no members of the team experience significant illness during the expedition. With the careful planning of the route by our local guide, no symptoms of Acute Mountain Sickness or stomach upsets were experienced. The weather on the whole was warm and sunny; requiring sunscreen, however due to the increase in altitude, temperature dropped especially at nighttime and walking in cloud was not uncommon. The group members had varying range of experience and fitness levels, but all found it a challenging and rewarding experience, each person achieving their own individual goals. With the views form the summit of Mount Toubkal being our ultimate reward. The expedition has spurred unit members on to gain future qualifications and also arrange future Adventurous Training activities.